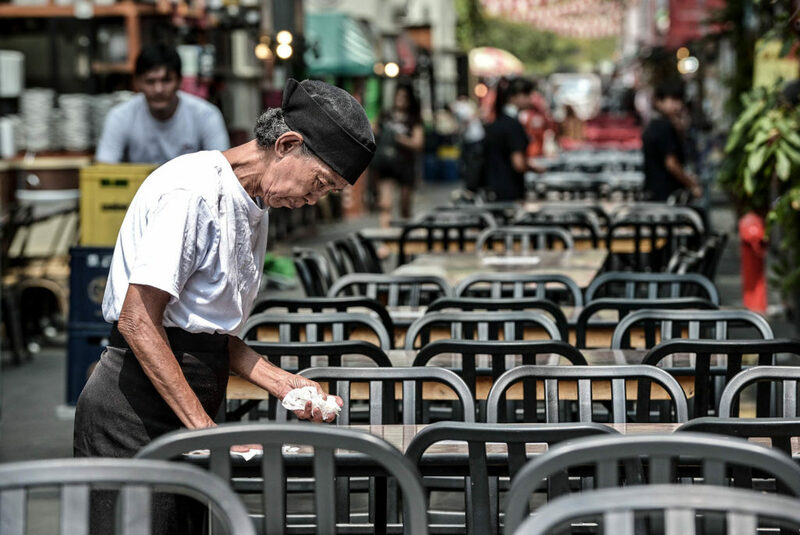 An elder worker cleans a table before the rush lunch-hour in Singapore's Chinatown district. Within the next 15 years, an estimated $20 trillion will be drained from Asia’s economy simply to keep up with the increased health care needs of its rapidly aging population. The strain of health care costs for the elderly (aged 65 years and older) will test the ability of governments to fund adequate health care programs, raise the specter of longevity risk for insurers who must deal with increasing lifespans outstripping coverage and squeeze the ability of pensions to remain viable. The number of elderly people in Asia by 2030 will increase by 200 million, a 71 percent increase, compared to 31 percent in Europe and 55 percent in North America. In Singapore, for example, the elderly population is expected to rise from 11 percent to 20 percent over the next 15 years, while it took France 49 years to do the same. 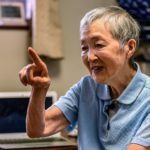 Similarly, Japan—where the elderly account for more than 28 percent of the population—is expected to become the world’s first ultra-aged nation by 2030. Investment in health care capacity typically occurs in tandem with economic development; however, rapid demographic aging results in countries growing old before they become rich, compromising their ability to achieve a high level of economic development to contend with the socioeconomic consequences of an aging population, including the increase in need for elderly health care. 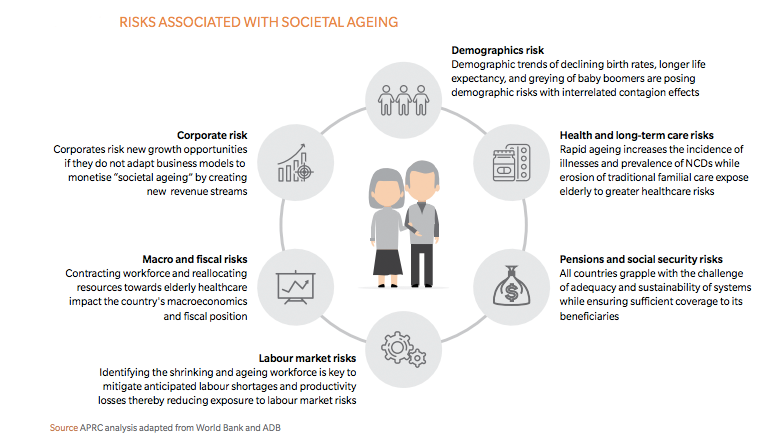 Marsh & McLennan Companies’ Asia Pacific Risk Center (APRC) estimates that elderly health care in Asia could increase five-fold to $2.5 trillion by 2030, if current cost trends remain unchecked. Demographic aging. Increasing life expectancy and falling fertility rates result in the growing number and proportion of the elderly population. Economic growth. Health care displays a positive income elasticity of demand. Accordingly, in tandem with the rapid economic progress in Asia, medical cost has been experiencing strong inflation, estimated at 10.3 percent in 2016. Increase in non-communicable diseases (NCDs). Societal aging is associated with increased prevalence of NCDs, such as diabetes and dementia. This compounds the burden on the health care system as increased life expectancy is accompanied by greater duration of disability. Health care model inefficiencies. This includes the practice of fee-for-service and fragmented care pathways that result in over-servicing and uncoordinated care. Pricing policies for new treatments without adequate consideration of the comparative effectiveness to existing treatments further contribute to medical inflation. For governments, escalating elderly health care costs (while relying on a shrinking workforce and reduced income tax revenue) may force a reduction in non-health care expenditure, increased taxation and borrowing or defaulting on their obligations, shifting the burden to the private sector and individuals. For insurers, increasing life expectancy leads to longevity risks due to the need to predict mortality and financial trends over several decades when pricing insurance products with long-term coverage. Furthermore, high medical cost inflation in Asia that has been outstripping returns on financial assets leads to a negative discount rate for medical insurance products. These risks translate to premiums that rise steeply with age and become prohibitively expensive for many elderly individuals. For individuals, the Melbourne Mercer Global Pension Index shows that many pension systems in Asia are lacking in adequacy, sustainability and integrity. Compounded by significant out-of-pocket payments for health care and a decline in intra-family support, elderly health care will strain personal retirement savings and exacerbate the effects of growing wealth inequality in Asia. Long-term care (LTC) is of particular importance to an aging population. APRC projections show that Asia will face a deficit of 18.2 million LTC workers by 2030, with China alone requiring 9.3 million more professional caregivers. This is mirrored by a shortage of LTC facilities. For example, Japan and South Korea are estimated to each require 100,000 or more LTC beds by 2030. Excess health care expenditures can divert resources away from areas that fuel economic growth, such as education, infrastructure and R&D. Increased borrowing and fiscal deficits may necessitate an increase in taxes and interest rates, which could place further downward pressure on economic growth. These risks highlight the opportunity for innovations in the health care ecosystem to create improvements in efficiency and patient outcomes. Potential solutions that could be adopted in Asia to improve the sustainability of health care provision for the elderly include hybrid insurance products that offset risks (e.g., longevity and morbidity risks) and enable insurers to offer medical and non-medical insurance products with long-term coverage at lower premiums. Integration and value-based health care delivery, which focuses on prevention and coordinated care, has also been shown to generate better patient outcomes and financial savings. Japan, for instance, in order to bridge workforce shortages, has been supporting the development of robotic technology to improve mobility of the elderly and to assist workers caring for elderly patients. The application of Uber-style collaborative consumption business models that provide in-home, on-demand nursing and caregiving services have the potential to be cost-saving and alleviate LTC workforce shortages, too. Access to good health care is a cornerstone for any country’s economic development. With a projected cumulative cost of $20 trillion over the next 15 years based on current cost trends, elderly health care represents a significant fiscal health risk all across Asia. Alternatively, it can be a potential driver for economic development and growth if funds are used efficiently by investing in capacity building and technology development and ensuring the health care ecosystem is equipped for the challenges of an aging population. 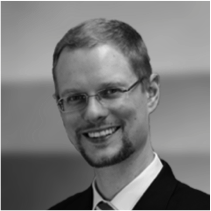 Wolfram Hedrich is executive director of the Singapore-based Asia Pacific Risk Center. He is also a partner within Oliver Wyman’s Finance and Risk practice. You can find him on LinkedIn here. Can Infrastructure Keep Pace with Progress in Asia? How Can MNCs Navigate the Age of Populism?